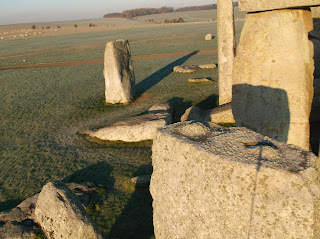 On the southern side of the now incomplete outer sarsen circle at Stonehenge there is a diminutive stone that leans. This is Stone 11 which has been broken. How it was broken and whether it has been re-erected are unknown. Its small size is often claimed to be evidence that the circle was never completed with lintels but the stone is broadening as it goes up and would have had a top that would have been wide enough to support lintels. Whether it did or not will never be known. 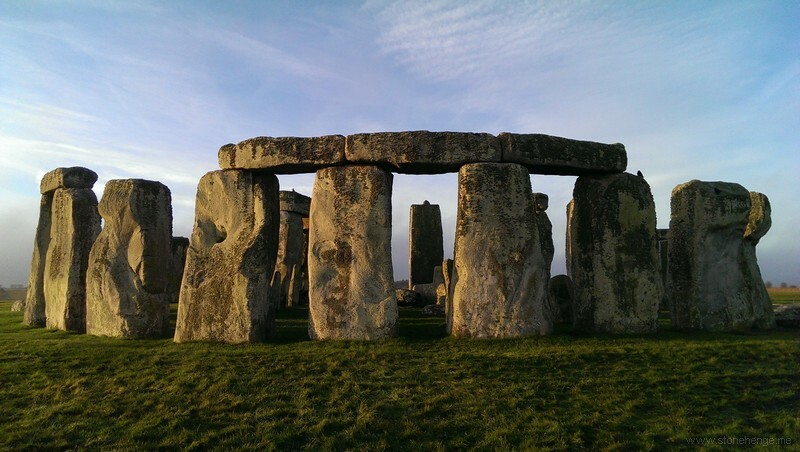 I think the size of it may be related to it being on the route in from from the southern entrance to the henge. Next to it there is the remarkable Stone 10 which does still have its full height and as can be seen in the picture two tenons. it is obviously designed to hold a lintel on both sides, including one to go over Stone 11. There appears to be wear and a ridge formed on the top surface where the lintels were. Maybe evidence that the circle was completed with lintels. Stone 10 on the ground plans is slightly out of true with the circle, but the stone twists as it goes up and the top is exactly in line with the circle, one of my favourite demonstrations of the clever engineering that went into building Stonehenge. Click to enlarge - Thanks to J for the photos. S-11 is one of my favorites too, as this punky, enigmatic little thing is fertile soil for a great many imaginings. I believe the outward lean and the stone's upper breakage are related. For the most part during the robbing period only previously fallen stones were removed. (The fallen Slaughter Stone is not only an example of failure, but also illustrates the point.) But this is not to say that attempts weren't made on standers, and I think S-11 was one of these. 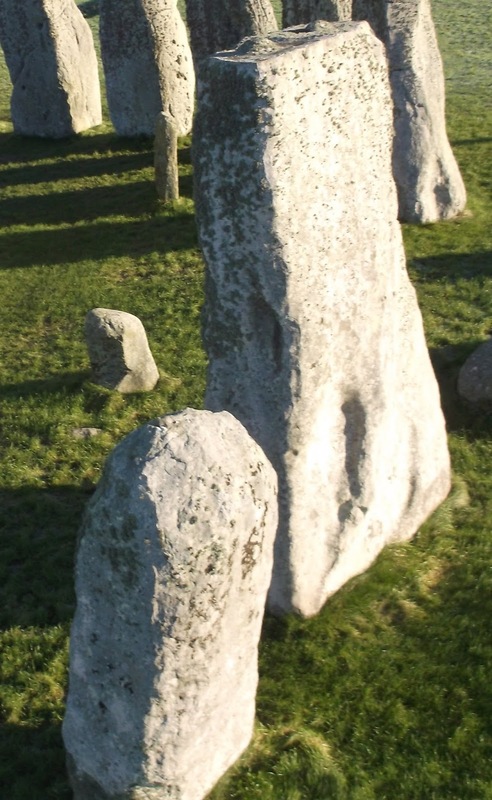 It's pitched into it's erection ramp, and to my knowledge, the only other stones to do this were S-6 and the aperture stones, which, because the lintels are still seated, happened naturally. So rope was slung around the top of -11 and draft horses started yanking it over and snapping it off, perhaps at at bedding fissure. They took the small chunk and left the broken upright to lean forever. Like you, I also believe that there's a direct correlation between Stone-11 and the Southern Entrance (or Exit!) A line from the Circle's center, drawn through -11, winds up bisecting the gap almost perfectly. It's off cardinal south by a degree or so to the west, but who's to say they didn't think it was right on the money? It may also be related to the Moon's monthly cycle. As Mike and Dan Johnson point out, if we count the Stones in the Circle we wind up with 29 ... and a half. So this tradition, like a number of other alignment curiosities, may have been carried over from earlier days. The flairing of the stone as it rises, in addition to the tenons on -10 and -12 is pretty compelling that it did indeed have a lintel. Great post! It's good to get back to the Stones for a while between important bouts of Tunnel Tawk.